The Sparco Chrono watch is the pinnacle of wristwear. With a 43mm diameter face and 15mm thick stainless steel case – this watch makes a statement on anyones wrist. 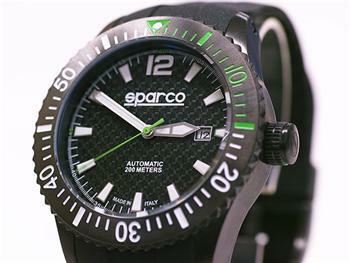 The non-glare mineral crystal glass and automatic Miyota 8215 movement are water resistant up to 200 meters. Available with a cabon dial with black bezel or colored face with steel bezel.